Ok here it is! I'm so excited about the rectangle ones on the right. 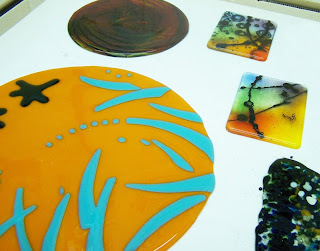 I had worked on some watercolor paintings with this same design and couldn't wait to see them in glass. The marigold and blue glass will be a bowl in about 24 hours from now after one more turn in the kiln. I know you just can't wait to see the finished bowl right?! The other things on the shelf are works in progress. Beautiful! Love it! Thanks for sharing! Look what's in the kiln today!